We are updating the the collection of New City Landscape maps and add two new world cities. The earlier maps can be found HERE and HERE. The new data comes from San Francisco and Sydney. In terms of physical Landscape they both have the Ocean as a defining element of the urban area, together with large water bodies enclosed by the urban area. In both maps these features come through in topography generated from the tweet locations. Image by urbanTick using the GMap Image Cutter / San Francisco New City Landscape – Use the Google Maps style zoom function in the top right corner to zoom into the map and explore it in detail. Explore areas you know close up and find new locations you have never heard of. Click HERE for a full screen view. 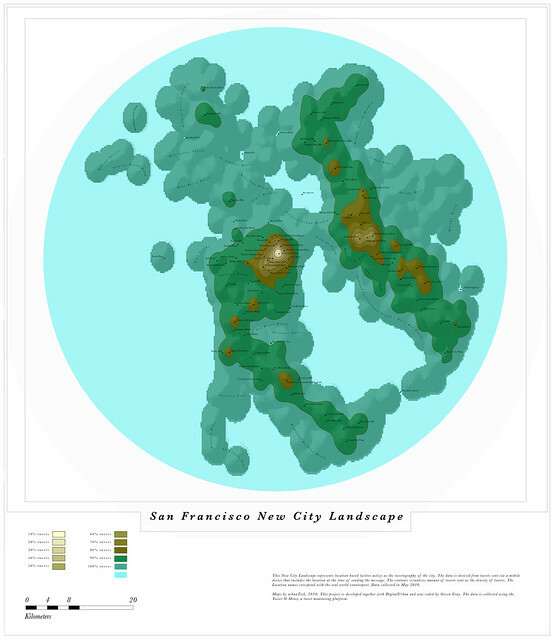 San Francisco on the other hand shows similar to New York multiple centres that grow together. Beside San Francisco, also Oakland and some other sub centres show up. A strong point is of course the airport again. Sydney has a very strong island characteristic, with downtown showing up strong on the right hand side. The Sydney map was developed in collaboration with ‘The Works Sydney’. Image by urbanTick using the GMap Image Cutter / Sydney New City Landscape – Use the Google Maps style zoom function in the top right corner to zoom into the map and explore it in detail. Explore areas you know close up and find new locations you have never heard of. Click HERE for a full screen view. The maps were created using our Tweet-O-Meter, in association with DigitalUrban and coded by Steven Gray, this New City Landscape represents location based twitter activity. Earlier maps cover London, New York, Munich, Paris and Moscow. Couldn't these 'island characteristics' also be an artifact of the bandwidth you have chosen in your density estimation? Could be really thats right, especially in the Sydney map, where we have lesser tweets. When people just type "San Francisco" as their locations, they are geolocated at the Market St peak in your diagram. Does your data collection compensate for that? Chris, yes, the map does not include any of the generic locations that might have been geocoded by some service. We are only using the true lat/long positions delivered from the device the message was sent from. In this sense it is a selection of all the tweets sent at the time. Also, the generic location that Google puts in for 'San Francisco' it at the crossing Market Street/Van Ness Street the main peak however, is further up Market Street -crossing 4th Street around where the Apple Store is located.